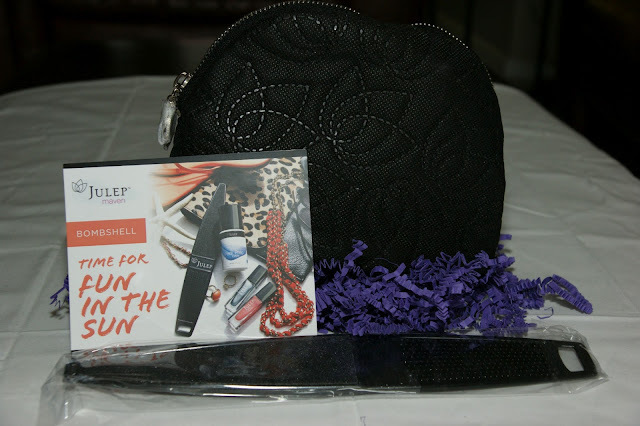 This is my first official monthly Julep Maven box! My regular style is "Classic with a Twist", but for this month, I switched it up and picked Bombshell. For those that aren't familiar with Julep Maven, around the 20th of each month, they send you an email letting you have a sneak peek at what's in your style's box. If you don't like it, you can choose another style. You can also pick your add ons at the same time. I actually got my box within 10 days of shipping, so really, the shipping wasn't too bad. I just don't really like the fact that the tracking numbers are dumb. Even as I enter it into my USPS app (or my Canada Post app), they aren't picked up. GRR!!! Anyways, for this month, I did add on two other polishes, but they ship separately (I really don't understand why) and they shipped for free. Those have yet to arrive. The girls in this Bombshell box are Sarah and Fina. Sarah is a pretty sneaky name for this colour. It's this hot raspberry sheer base with very fine iridescence and glitter. And it's not this sissy sheer raspberry base, either. It's packs quite the colour punch. I can see Sarah and I becoming fast friends. Fina. She's as exotic as she sounds! 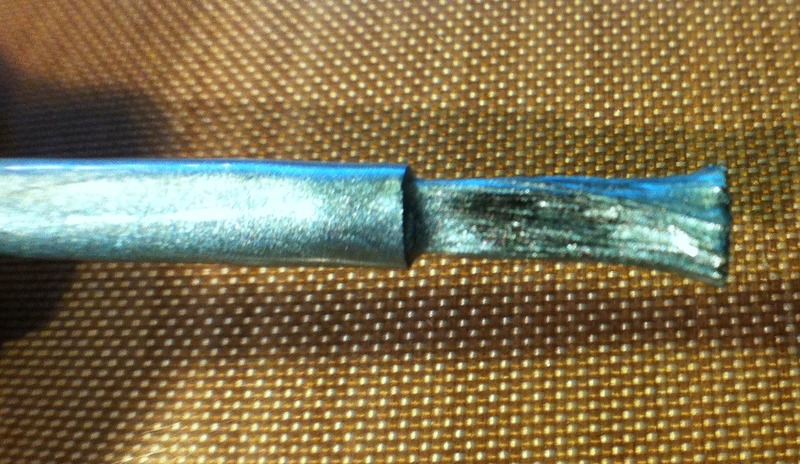 She's a sky metallic blue with a mod chrome finish. Very edgy and very cool! There was something wrong with the brush though - it was a little splayed... It made for a very messy, streaky and uneven application. Not impressed. The colour is truly stunning and it's the perfect metallic blue to be wearing in the summer because it's a warmer shade of metallic blue. Overall, I'm pretty happy with the box that I picked. I am disappointed with the brush, but I did read something on Facebook about Julep shipping out replacement brushes, so we'll wait and see. I'm still anxiously waiting for my mystery box to arrive though! Total Value of Box : $54.00. Not bad for $19.99! Second thing, for those that currently subscribe to Glymm, you probably received a cryptic email announcing Glymm Nylon S/S 2012, limited edition ($12/month. Currently Glymm costs $10/month). Once again, I'm not sure what it is exactly, but if anyone knows or has some good theories, throw them my way! I've never been a very patient person and this is no exception! Here's my theory though...I think that they are testing a new box. Perhaps it'll be one that they will roll out permanently to eventually replace their current box and increase the price point. Think MyGlamBag in the US. I hope that this is a positive move for them because I'm on the verge of cancelling them....so it looks like I might have to give it a few more months! I got that email too! When I got that email I thought Glymm was just expanding their services to provide monthly nylon "stockings" lol, I didn't know I was looking at a bag. I haven't been impressed with Glymm so I'm willing to give Nylon a try. Also, email Julep. They are aware that they shipped out a bunch of defective brushes. Contact them and they are willing to replace the brushes for you. Thanks for the tip, I'm going to email Julep right away. It was just disappointing to see that defective brush, but I'm really happy that they are willing to do something about it! I'm still waiting for my add ons as well...I don't understand why they are shipped separately. I received my It Girl Box 2 days ago and am still waiting on the add-ons. I ordered Sarah as my add-on because it looked so sparkly and pretty! Definitely email Julep about your bad brush! I wonder how noone noticed such an obvious issue before sending them out? Keep us updated on the Glymm news- hopefully they'll revamp and improve because I am sure they're noticing a decent amount of cancellations because of their boxes lately. I don't know how they didn't catch this....Maybe they don't have quality controls in place? I'm glad you mentioned the bad brush. In my May Julep box, both my brushes are like that. At first, I thought maybe I'm imagining things. But when I apply the nail polish, it's so hard to " paint within the lines". 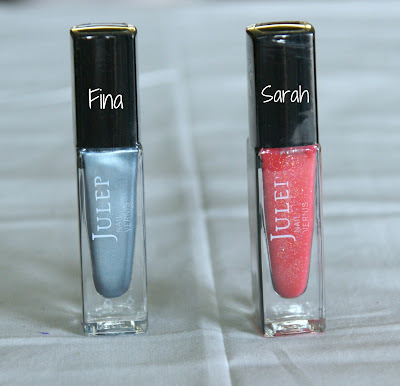 Now that I know I'm not the only one, think I will contact Julep and let them know about the problem. Yes, do! I've already emailed them about the brush and I have to take pictures of them - or more specifically, the number at the bottom of the bottle. They also said that it would take some time before they could get replacements out. :( Good luck! I emailed Julep and let them know about my bad brushes. A few days later, got an email back saying they are working on sending out replacements. Today, just got the shipping confirmation of the replacements sent out.